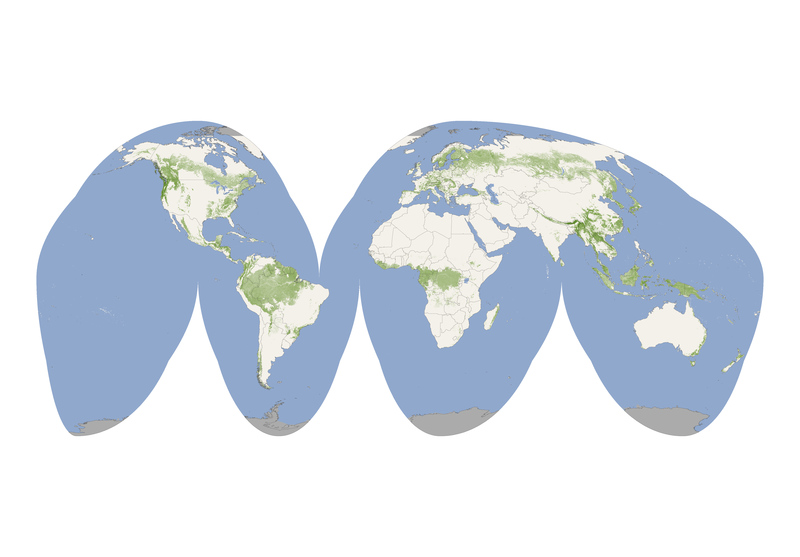 NASA has mapped the world’s forest heights, based on satellite data, for a first-of-its-kind global view. While there are plenty of maps that show forest height regionally and locally, this is the first time it’s been mapped globally with a single, uniform method. The new map shows the world’s tallest forests clustered in the Pacific Northwest of North America and portions of Southeast Asia, while shorter forests are found in broad swaths across northern Canada and Eurasia. The map depicts average height over 5 square kilometers (1.9 square miles) regions), not the maximum heights that any one tree or small patch of trees might attain. These heights range from 0 to 70 meters. The darker the green the higher the tree canopies. NASA believes the new map could help scientists with a new perspective on how much carbon forests store and more insight on carbon cycles within ecosystems. Click through to NASA for the high-res version. I suppose I knew this but never actually struck me till I saw this visual. Most of the earth’s landmass is NOT forested. I’ve just happened to live and visit the places that are forested. Yep. We like to see things are rare and out of the ordinary, right?